Drywall installation is almost always needed at new construction sites and sometimes in building and home improvement projects. 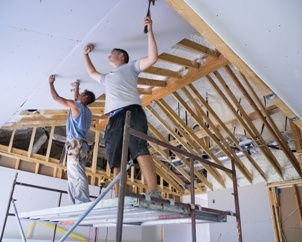 While not as dangerous as some construction jobs, drywall installers face many dangers of accidents that can lead to injuries. They may need to take months or longer off work to recover or their injuries may permanently limit their ability to work or perform day-to-day activities. Fortunately, they may be entitled to New Jersey’s workers’ compensation benefits. What Are the Causes of a Drywall Installer’s on-the-Job Accidents? Heavy lifting. Overexertion injuries are one of the most common injuries drywall installers suffer. Workers installing drywall must handle heavy drywall sheets that can weigh anywhere between 55 to more than 120 pounds multiple times each workday. Often they must also bend while lifting it. This can cause workers to suffer overexertion soft tissue injuries, such as back, spine, and shoulder injuries, that can require rest, medication, and physical therapy for months or longer before the injury heals. Repetitive movements. The tasks involved in installing drywall are repetitive—taping, sanding, and cutting are a few. This can result in workers suffering repetitive movement injuries to their hands and wrists, such as trigger finger and carpel tunnel syndrome, or back strains, sprains, and other injuries. In some cases, a worker could suffer chronic pain and limitations of movement that prevent him from performing the physical jobs associated with drywall installation. Falls. Falls are another leading cause of drywall workers’ injuries—and deaths. Working from heights or ladders while carrying or handling drywall sheets can result in a worker losing his balance and falling. Tools, debris, construction materials, and spilled food and drink can also pose fall risks for workers. Workers can suffer traumatic brain injury, broken bones, fractures, internal organ damage, or spinal cord damage if they fall. Long work shifts. Many soft tissue injuries that drywall installers experience are made worse when workers have no time to rest the injury during the work day or work long shifts. This does not give injuries, like strains and sprains, time to heal, and a worker may be forced to take time off work as the pain intensifies. Cold weather. Drywall installers working on construction sites may be exposed to cold weather, which can reduce circulation and make repetitive strain injuries more likely. Stress-related accidents. Workers are often under pressure to get the job done quickly and can fall, lift improperly, or otherwise be injured in an accident in the haste to meet an unrealistic work schedule. Be certain installers know the weight of the drywall sheets they will be working with. Use forklifts, trucks, carts, and dollies to transport drywall sheets rather than having workers carry them. Reduce the need to move drywall sheets by having them delivered to where they are being installed instead of a construction material storage area. Use work-saving equipment like drywall jacks or lifts to reduce the repetitive movements and overexertion that lead to injuries. This can also reduce injuries when the sheets are heavy or workers are hanging drywall on a ceiling. Store materials safety so that they do not become tripping hazards. Teach workers safe lifting practices. Schedule two workers per sheet to carry heavy drywall sheets when they must be carried manually. Rotate tasks and allow workers to take breaks to rest their strained and sore muscles. Schedule drywall installers’ workloads on a realistic schedule to avoid accidents caused by rushing. If you are a drywall installer, you may need to fight to obtain the workers’ compensation benefits you deserve. You need the assistance of an experienced workers’ compensation attorney. To learn how I have helped other workers like you, review my testimonials. Then call my office to schedule a free consultation.